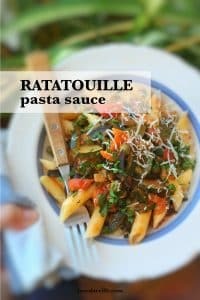 Ratatouille Pasta Sauce Recipe | Simple. Tasty. Good. The KitchenAid Food Processor Slicer is a great way to chop up a good amount of ingredients. The bowl is quite large and can hold a bunch of stuff. So that’s why I thought I would make a delicious portion of ratatouille pasta sauce and see how things go. And why not pour it all into a video recipe? This video is a quick 1-minute overview of how to prepare this ratatouille pasta sauce, you can find a full list of all the ingredients and a full recipe description below this introduction, just scroll down! Well it worked out brilliantly as you can see! It takes just a couple of minutes to clean and trim the vegetables to make them fit in the small food pusher tube. Other than that once your prepping is done, you’re in for a pleasant ride! The slicer blade is sharp and fast. Doesn’t matter how many vegetables you have to cut, the KitchenAid Food Processor will take care of that. And the vegetable bits are of the same thickness which will make your dish cook evenly then. OK, so the veg are cut and the chef is happy! Remove the Food Processor bowl with the chopped vegetables and attach the bowl of the KitchenAid Cook Processor to the machine. What else do we need to cook our ratatouille stew in? it’s a 2-in-1. Homerun. In the end: the ratatouille pasta sauce looks terrific, just the way I wanted it to be. Chunky, not too runny, colorful. I served it over cooked ziti pasta. Nothing but hums and yums at our dinner table! Also check out another recipe that I prepared with my KitchenAid Slicer: my chunky waldorf salad! Slice the vegetables into thick strips because they have to be thin enough to go through the food pusher. Let’s move on to the Cook Processor: attach the transparent Food Processor work bowl and then remove the cover. Take the manual adjustable slicing disc and adjust the slicing thickness by holding the drive adapter in one hand and then turning the adjustment collar until you reach the widest thickness. Carefully place the slicing disc in the work bowl. Close the cover, make sure it is locked into place. Then turn on the Cook Processor. Set the Speed to 6. Fit the food pusher into to feed tube of the bowl cover. Then add the zucchini, eggplant, bell pepper, onion and garlic to the feed tube. Use the food pusher if necessary, don’t use your fingers! Once the ingredients are chopped, turn the Cook Processor off. Carefully remove the transparent lid. Then stir the chopped vegetables. Remove the food processor bowl and replace it by the Cook Processor bowl. Add the StirAssist and attach the lid. Add the olive oil, bay leaves, rosemary, canned chopped tomatoes, tomato paste and chopped vegetables. Then season with pepper and salt. Close the bowl and select STEW P2. Then press Start to activate the program. In the end, press cancel to exit the keep warm mode. Stir in the capers and brine. Check the seasoning and add extra pepper or salt to taste. Serve with al dente pasta.